^ 侯成德. 《苏美英首脑雅尔塔会议》. 中国世界史研究网. [2010年2月]. （原始内容存档于2008-10-17）. ^ 林思云. 《蒋介石的眼泪》. 中国报道周刊. 2003年5月18日. Best, Geoffrey. Churchill: A Study in Greatness. London: Hambledon and London, 2001. Black, Conrad. Franklin Delano Roosevelt: Champion of Freedom. Cambridge, MA: Perseus Books Group, 2003. 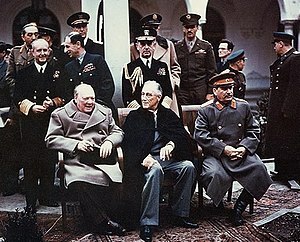 Clemens, Diane S. "Yalta Conference." World Book. 2006 ed. vol. 21. 2006, 549. "Cold War: Teheran Declaration.". CNN. 1998. 26 March 2006. Meacham, John. Franklin and Winston: An Intimate Portrait of an Epic Friendship. New York: Random House Inc., 2003. O’Neil, William L. World War II: a Student Companion. New York: Oxford UP, 1999. Perisco, Joseph E. Roosevelt’s Secret War. New York: Random House, 2001. “Portraits of Presidents: Franklin D. Roosevelt.” School Arts Magazine February 1999: 37. Student Research Center. EBSCO Host. Philadelphia. 2 Apr. 2006. Keyword: FDR. Snyder, Louis L. World War II. New York: Grolier Company, 1981. Sulzberger, C L. American Heritage New History of World War II. Ed. Stephen E. Ambrose. New York: Viking Penguin, 1998. "Yalta Conference." Funk and Wagnalls New Encyclopedia. World Almanac Education Group, 2003. SIRS DISCOVER. Philadelphia. 2 April 2006. Keyword: Yalta Conference. How good was the Good War? Special German series 2. The Committee on Dismemberment of Germany Allied discussions on the dismemberment of Germany into separate states, March 29, 1945. The commite was ordained at Yalta.